Argentina Activist named Pato Teseira has raised her undisputed concern on the upcoming 30th May SIT-AT-HOME that was declared by the highest command of IPOB, stating that the SIT AT HOME is a welcome development and also a great roadmap to Biafra restoration. 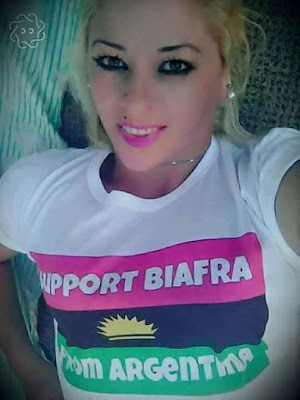 She categorically explained and called on all the slumbering Biafrans to stand up for their rights and fight for the freedom of Biafra without fear before their enemies because it's the right of all the indigenous people to determine their future which is the total sovereignty of their territory. Pato Teseira encouraged all the Biafrans in Biafra land to keep moving on with their relentless hard work towards Biafra restoration project. 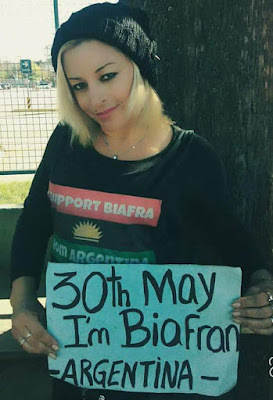 She continued by stating that Biafrans are the most blessed species on the planet earth by the supreme creator of the havens and the earth, urging all the Biafrans occupying various offices in Nigeria to observe the 30th May SIT-AT-HOME for it's a roadmap that will define the absolute determination/fate of Biafrans whether to exit from the lawless and British concocted entity called Nigeria or remain. Biafra is a great mandate which her total liberation will save not only the black race, but will save the world from spiritual and physical blindness. Over 3.5million Biafrans, mostly children and women who were massacred and Killed by starvation during the genocidal war which was unleashed on innocent Biafra populations by the wicked and murderous world leaders by the British/Nigeria government must be remembered. Their memories can never be forgotten for their spirits will never rest till Biafra is restored. Pato Teseira also lamented that there are need to implement team work in other to secure the observation of 30th May SIT-AT-HOME , it's also a welcomed development because two heads are better than one and a tree cannot make a forest, she said." Everyone have his/her role to play in securing the observation of a Semi-Referendum which will be coming up in the form of SIT-AT-HOME on the 30th May in Biafra Land and in other part of Nigeria. She also called on all Biafrans still serving in various Nigeria political offices to help in every means possible without sabotaging the upcoming 30th May, for the total shutdown of Biafra land will skyrocket the agitation and also determine Biafrans fate whether to exit from Nigeria or not. FROM THE BIAFRAN RABBI. WE ARE NOT ONLY IN SUPPORT OF BIAFRA'S RESTORATION BUT IN A MILLION TIMES READY FOR GOD AND MAN. WE ARE BIAFRANS AND SATAN AND NIGERIANS COULD NOT STOP CHRIST JESUS AND SO THEY HAVE FAILED AGAIN ON BIAFRA. BIAFRA IS THE ANSWER TO AFRICA AND GOD'S DIVINE PURPOSE IN THIS LATER TIMES.#BIAFRA#ISRAEL RISING#TERRORIST MBUHARI MUST DIE#ZOO MUST FALL. America all we need is biafra,U.N all we need is biafra,EU all we need is biafra,ASIA all we need is biafra. For the entries world all we need is biafra. We no retreat or Sourender is biafra from the south south to the south east. Biafra for sleep biafra for wakeup,biafra for dream,biafra when I eat,biafra when I visit friends,biafra as a dream. Biafra even when I stand or bend down. Biafra on the go. Biafra even when I look the sky. Even biafra when the zoo army chase us but biafra is to victory. Up to biafra even when i look at buhari face,IBB,OBASANJO and all those past president I can not mention plus all past and the present vice president. Long live biafra long live NNamdi kanu and all entitled family home and abroad. Enemies of biafra down progress of the haters of biafra. Lovers of biafra fast progress of biafra lovers. All hail biafra.